*Books available online or at any major bookstore. Purchase online HERE. 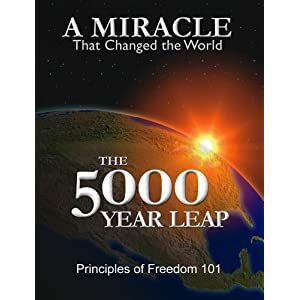 This book details 28 principles based on morality, faith, and ethics that our Founders applied in propelling what amounted to a 5000-year leap in freedom, prosperity, and progress. Dr. Skousen explores traditional American values that made possible this extraordinary American miracle. We recommend this book for its historical perspective on the Constitution, and not for any denominational theological viewpoint. The late Dr. W. Cleon Skousen (1913-2006) was a popular teacher, lecturer, and author. Born in Canada, his growing up years were spent in Canada, Mexico, and California. He served the in FBI for 16 years and then as Salt Lake City Chief of Police for 4 years. He also ran for Governor of Utah. In 1972 Dr. Skousen organized a non-profit educational foundation, named The Freemen Institute, later changed to The National Center for Constitutional Studies. In so doing, Dr. Skousen and his staff became the nation�s leaders in teaching seminars on the Founding Fathers and the U.S. Constitution. His book, The Making of America, has been used nationwide to educate students on the Founders original intent; and The Naked Communist was a national best seller. He was a former professor at BYU. Praise for the Book: The fight for the soul of our country is real! Every patriotic American, young and old, should read this book!" Book clubs and Study Groups are in, and for good reason! It's fun and enriching to share a good book and discuss the issues with your friends. Contact several of your friends to invite them to join you in forming a study group. (5-10 is a good sized group, but less or more works, too.) Let them know when and where the first meeting will be held, and ask them to bring their copy of the selected book. Recommend that they read at least one chapter. You can meet in your home, a restaurant, your local library - whatever suits your situation and the number of members you have. You may want to serve light refreshments or just coffee. Happy reading, discussing and learning!